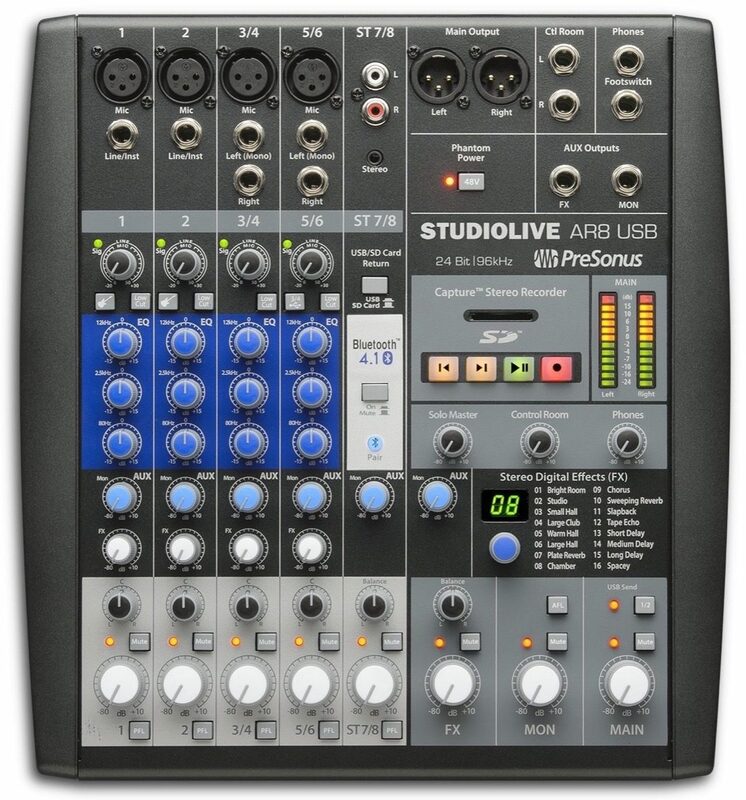 The PreSonus StudioLive(R) AR8 USB 8-channel hybrid mixer makes it simple to mix and record live shows, studio productions, band rehearsals, podcasts, and much more. This is a musician's mixer: lightweight, versatile, feature-rich, and packed with analog connections and digital tools, yet easy to learn and use. 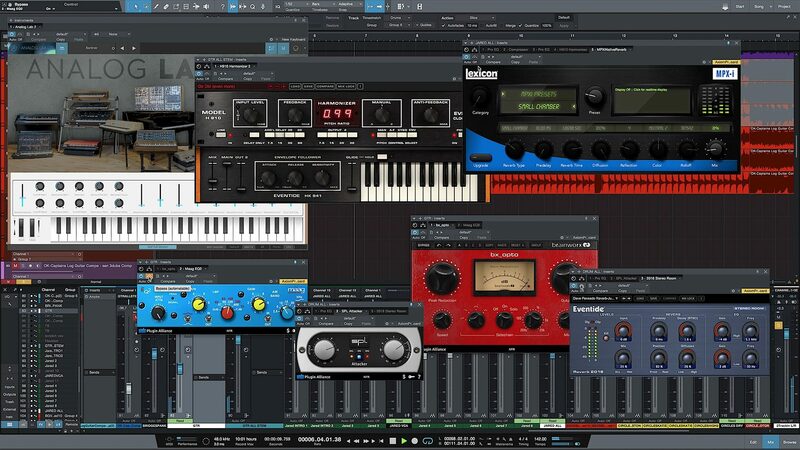 Mix with PreSonus' famous Class A preamps and three-band EQ. Create multitrack recordings and fly in backing tracks with a 24-bit, 96 kHz, USB 2.0 digital audio interface. Record and playback in stereo with the integrated SD(TM) digital recorder. Stream program music wirelessly, using onboard Bluetooth(R). Compact and road-ready, StudioLive AR mixers provide a superior all-in-one solution for mixing and recording your performances. StudioLive AR8 USB mixers are packed with the connections and controls needed to mix and record live, in the studio, and in rehearsal. Each of the two mono channels and two stereo channels includes level control; a mic input with one of PreSonus' prized Class A preamps; three-band EQ; and more. Besides the main outputs, you get a monitor mix output with a dedicate bus for feeding a stage wedge, headphone amp, or in-ear system. Since the StudioLive AR8 USB is also a studio mixer, you also get control-room outputs with level control to feed your studio monitors. Most mixers make you route acoustic and electric guitars and basses through external direct boxes before connecting to a mixer input. But with StudioLive AR mixers, Channels 1 and 2 have high-impedance instrument inputs, so you can plug a guitar or electric bass straight into the board--no direct box needed. Our unique Super Channel (stereo Channel 7/8) allows you to connect four stereo analog and digital sources at once, enabling you to use the mixer with your high-tech devices. Plug a media player into the Super Channel's unbalanced RCA and 1/8-inch stereo inputs, play stereo audio from the onboard SD(TM) recorder or from your USB-connected Mac(R) or Windows(R) PC. Use onboard Bluetooth 4.1 to pair your phone to your StudioLive AR mixer and instantly have wireless access to your music library for break music, backing tracks, or ear-training. Have a song you want the rest of the band to learn? Pair your phone and start rehearsing! Record in the studio or at the gig--with or without a computer. Naturally, you want to record your gigs, as well as producing studio projects, podcasts, and so on. It's smart to record your rehearsals, too. So StudioLive AR mixers offer two different ways to record. Connect a StudioLive AR8 USB mixer to your computer via USB 2.0, and you have an 8x4 multitrack digital recorder, ready to capture all input channels plus the main mix to a Mac or Windows PC with professional, 24-bit/96 kHz quality. An onboard stereo SD recorder lets you record the main mix without a computer--just hit Record and go. Recording can't get much easier than this! Both the integrated USB recording interface and the SD recorder have multiple uses beyond simply recording. With just a few backing tracks, your small band can sound like a much larger act, so we enabled the USB interface to play back two stereo streams through the mixer--great for backing tracks, click tracks, or program music. Use the SD recorder to play up to 32 GB of MP3 and .WAV files for hours of program music or backing tracks without needing a computer. And don't forget the Bluetooth feature in the Super Channel, which lets you play break music straight from your smartphone. With several ways to get the job done, you can work the way you want to. PreSonus StudioLive AR mixers are tightly integrated with state-of-the-art recording software to help you achieve your creative vision. Record with PreSonus' Capture(TM) live-recording software, then edit in our award-winning Studio One(R) Artist DAW (recording and production software); both are included free. To get a great mix, you need high-quality effects. The StudioLive AR8 USB has you covered with an internal stereo effects processor with 16 presets, including an assortment of room, hall, and plate reverbs; chorus and delay effects; even a preset that emulates an acoustically treated studio room to provide a warmer, more intimate tone. A dedicated effects return, complete with master level fader and dedicated monitor send, lets you adjust the amount of the effects in your main and monitor mixes. You can even bypass the effects with a footswitch (optional). It's just another way that StudioLive AR mixers enable you to build professional-quality mixes and recordings quickly and easily. A complete solution that's compact, easy to use, and built for the road. Designed exclusively for StudioLive mixers, free Capture multitrack recording software for Mac(R) and Windows(R) allows instant setup and one-click recording of up to 34 tracks at up to 96 kHz (or 64 tracks at up to 48 kHz), directly from the mixer, with no configuration. Capture simplifies your live-recording environment, providing only the tools necessary to do a true virtual soundcheck and record a great performance, without placing huge demands on your CPU. And because Capture looks and operates like a classic multitrack hard-disk recorder, it's instantly familiar. Best of all, Capture uses the highly lauded, 64-bit, Studio One(R) audio engine, so your tracks will sound amazing! Studio One is a completely modern professional environment for music recording, mixing, mastering, sharing, and collaboration. It's Internet-savvy and provides a complete solution, combining the features you really need with the ease of use you always dreamed of. Based on an elegant user interface and a content browser with powerful drag-and-drop functionality, feature-rich Studio One will let you work quickly and stay focused on your inspiration. Below are the minimum computer-system requirements for use with Capture(TM) and Studio One(R). The minimum system requirements may differ for DAWs other than Studio One(R). Please check the requirements for your DAW of choice with its manufacturer. Overall: I'm a DJ running dual Bose L1 systems and needed a mixer that could live up to the sound expectations of these speakers and my clients. The PreSonus AR8 does a beautiful job. The gain staging is precise and clean, almost no hiss in the speakers. After setting the levels for mics and mixer board, the main output level was barely at quarter the way up and it was almost too loud!!... and this was an outdoor event! The Bose speakers were set to the halfway mark. Bluetooth paired quickly and sounds fantastic. I only wish there was EQ on the super channel, but I only used it for sound effects so it was fine... also very loud. The SD card recording feature is superb. I was able to record part of my performance and I will be using it to improve on future gigs. I have not used the usb in or out as yet, so I have no review for that. The sound effects are very nicely done. I scrolled through them all and they really are usable in many situations. I particularly love the "spacey", "short delay" and "large club" effects. The 3 band EQ really gives music a nice warm feel. The knobs are a little wobbly, not like the Allen & Heath which has knobs mounted on individual metal stems, but that's not a deal breaker at all. I just expected a stiffer feel. Overall, this is an excellent mixer. Really high headroom and super clean. Lightweight and it sits with a perfect slope for performances. I would recommend it to any band, DJ or producer out there, after all, it's a PreSonus! These guys know what they're doing. "Presonus Packed A Lot of Studio Inside"
Overall: I bought a StudioLive AR8 Mixer to use for voice-over work. I love the onboard 32G SD recorder...it's like getting two pieces of equipment in one. I have not used the software package that came with the mixer since I use Sound Forge Pro 11 in the studio. I wish I had gotten the AR12 now that everything is connected. I trusted Presonus after I tried out an EV RE20 mic using a Presonus iTwo and the mic amp was at 50% with loud, clean sound! I figured I couldn't go wrong connecting my Neumann mic into any Presonus USB device after that! The StudioLive AR8 USB Mixer has transparent mic amps and is very clean sounding. It has replace a more expensive UA Apollo Twin USB device because of the quality of its mic amps. This compact 8x4 usb mixer is working great for a variety of voice-over projects. The only drawback is the drivers and software which are 64 bit and sound Forge Pro 11 is still 32 bit. To solve the problem I'm dumping the win10 PC and loading everything onto a MACBook Pro. But, Presonus drivers and the included recording software package works with either OS. Style of Music: Meditation, Commercials, MultiMedia, Audiobooks, OnHold, Training Programs mixed with music and multiple voice tracks.